South Nation Conservation (SNC) and its 16 member municipalities have a shared concern over the decline in forest cover within the SNC jurisdiction in Eastern Ontario. Reports produced in 2016 analyzed aerial imagery and local land use changes to provide an update on the status of forest cover. Regional forest cover, which is closely linked to ecological health, is below Environment and Climate Change Canada’s minimum recommended level of 30 percent. In 2014, forest cover was at 28.1 percent with 13,148 acres of forests lost between 2008 and 2014. Research demonstrates that this minimum only supports half of the potential species richness and marginally healthy aquatic systems. The loss of regional forests is a result of land use changes and development; including agriculture, residential, industrial/commercial, solar farms, and unsustainable harvesting. Consultations led the SNC Board to direct special funding to two stakeholder working groups to produce recommendations to help conserve and improve forest cover. The first working group was composed of agricultural producers, the second group included new stakeholders from partner municipalities, First Nations, land development, forestry and public. Forests provide many important ecological, economic, social and cultural benefits to humans and the environment. Research and local data identify that decreases in forest cover result in decreases in water quality and quantity and increases in flooding, droughts and erosion. Forests also sequester carbon, release oxygen and provide critical habitat for fish and wildlife. Protecting biodiversity is a shared responsibility for all Canadians and all levels of government; federal, provincial and local. The role of a Conservation Authority is to work with local partners to manage natural resources with human activities; to find a balance between people and the environment; economy and ecology. This forest conservation initiative included two years of review by local stakeholders and government representatives through public working groups to create a series of recommendations for the SNC Board and member municipalities. Discussion and debate was shared by groups of diverse and passionate people who came together with a goal of protecting and increasing forest cover in the South Nation Conservation jurisdiction. Recommendations are summarized within this report and include suggested program enhancements, forest conservation initiatives, strengthened partnerships, review of legislative tools, policy changes and a strong focus on communications, education and outreach. 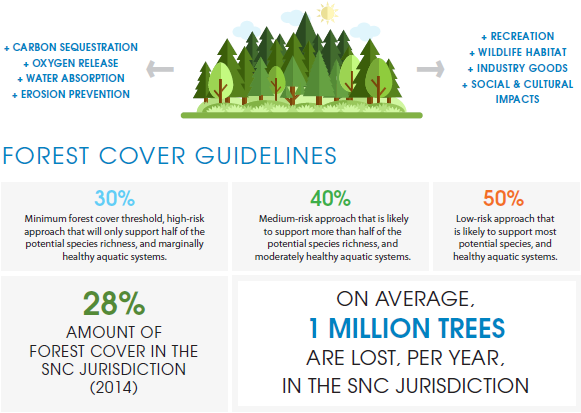 Click to read our 'Protecting and Increasing Forest Cover in the South Nation Conservation Jurisdiction, August 2018' report now! Click here to visit our new 2008-2014 Interactive Forest Cover Map. In addition, we now have an archive of forestry news articles from news sources around the jurisdiction from 2013-2016. Ontario Nature is asking you to sign their guestbook and tell them why you care about protected places! More than 4,000 individuals have signed our protected places declaration and 100 organizations have endorsed it. Thank you for your commitment to conservation.